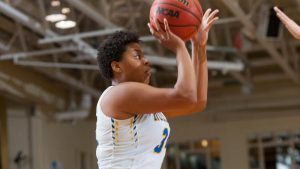 With an overall record of 20—6 and 14—4 in conference play, the Rollins Women’s Basketball team hosted Florida Tech to begin the first round of postseason play. Overall, the Panthers have a season record of 13—13, with a losing record in conference play, playing Rollins as the higher seed entering the game. The Lady Tars are currently on a twelve-game win streak after coming out on top against conference rival Saint Leo. The Saint Leo game was also senior day, where three seniors were featured; Tanaya Jones ‘17, Brittany Betts ‘17, and Marie Gilbert ‘17 played their last regular season game in the Alfond Stadium. The Tars captured the lead with 6 minutes and 57 seconds left in the third quarter and never looked back, extending their lead to 13 points to victoriously end the game. The Tars hoped to use that “never look back” phenomena to propel them through the off season, but the SSC quarterfinals did not seem to go their way. The game itself featured six ties and ten different lead changes, but in the end the Tars lost the hard-fought battle 70 – 73. Gilbert led the way for the Tars scoring 19 points and 7 rebounds, with Julia Ingler ‘18 close behind with 16 points and 6 rebounds. Within the first quarter, Rollins jumped out on top. The team showed energy, strength, and confidence in each other as they led the Panthers 13—4 with a 9-0 run. With five minutes left, the Panther’s coach called a timeout which seemed to change Florida Tech’s attitude and pushed them to go on their own 10-0 run. The Panthers managed to end the first quarter with a 19— 18 lead. The second quarter seemed to particularly emphasize Rollins’ defensive skills. While blocking multiple shots and placing massive amounts of pressure on the offense, the Panthers went 0-5 consecutive shots. The game continued to go back and forth between each team taking the lead, but the score remained in favor of the Panthers entering the final quarter, 52—51. The last quarter was incredibly suspenseful. The seniors on the court left their hearts on their sleeves and battled until the end to continue tying the game and taking the lead. The score tied two different times, with three separate lead changes. However, with less than five minutes left, the Panthers took the lead and Rollins could not seem to catch up from there. The game ended 73—70. Rollins’ shooting seemed to be the weak link throughout the game—the Tars shot for 40%, compared to Florida Tech’s 50%, and when it came to 3-point shots, Rollins only made 25% compared to the Panther’s 50%. However, Rollins remains far ahead of Florida Tech, 52—23, in their all-time matchup record. Fortunately, this is not the end of the road for the Tars in postseason play. Rollins remains the number three seed as they hope to receive a bid for play in the NCAA South Regional Tournament coming up. The selection show will be hosted on Sunday, March 5 at 10 p.m.
Stay tuned for updates on the Rollins Women’s basketball team through NCAA.com and Rollinssports.com.